The Burgers Guys have spent a lifetime eating and critiquing this genre of American cuisine. We understand the subtle differences between a great cheeseburger and a classic work of art. We have ventured off to restaurants that have been recommended by our readers to find only Alpo quality burgers that the the masses shovel down without a discerning palate. But you can not be blamed. The majority of Americans have been raised on frozen McDonalds' fries and mom's dried out, old meatloaf. No recommendation will ever capture a place in our hearts if the chef cares so little as to insult us with frozen fries. We constantly shake our heads in disgust as we dump leftover, white tasteless, potato-like sticks into the trash review after review. We will never understand the reason why a cook would open a restaurant and deliberately serve substandard food when a quality product is cheaper and superior. Yesterday, the Burgers Guys marched over to the local Safeway and priced a ten pound bag of fresh Russet potatoes for $1.99. We then compared that to the $2.69 price tag on a one pound bag of frozen shoestring potatoes. I would rather eat Dr. Meat's oily styrofoam cup, than try and gag down another bag of tasteless frozen fries. How much effort does it take to jam a potato into a slicer-dicer? Before a reader recommends another hamburger restaurant, ask if they are serving frozen fries or fresh cut potatoes. Jaspers is a local version of McDonalds; the food tastes about the same, but the portions and prices are larger. The French fries are the same tasteless, hot, oily, white, sorry excuse of frozen potatoes that we find and most fast hamburger restaurants. If the guy working over the grill could have counted over ten, the Burger Guys would have explained the profit margin that was escaping his cash register if he purchased fresh potatoes. The burger was a 1/3 pound of fresh ground beef fried on the grill with very little or no seasoning. 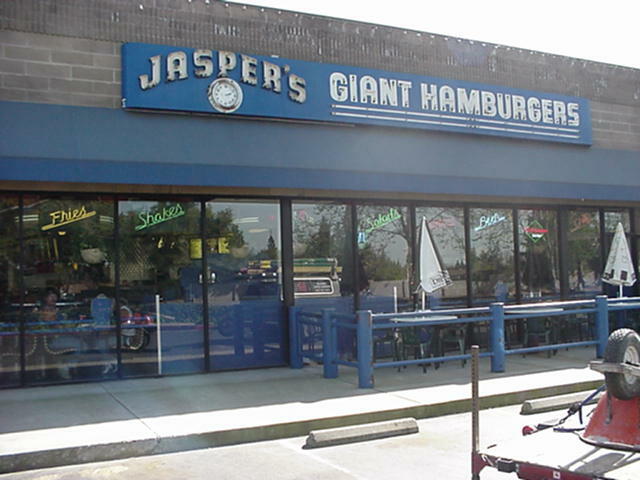 If Jasper's Giant Hamburgers purchased fresh potatoes, the extra profits could be spent on some salt and seasoning for their Giant Cheeseburgers. Every chef knows to taste for seasoning, so what is going on here? The burger was topped with two slices of generic, super-processed American Cheese. All it offered, I am sure, is calories because it supplied no flavor. Atop the yellow, was leaf iceberg lettuce, red onion, tomato and perfect amount of mayo and mustard. This was placed inside a out-of-the-bag, lightly toasted Wonder-type sesame seed bun. This 50's style restaurant serves anything but 50's style food. Here, big is more important than good. Neon is more important than taste, and image is much more important than reality. Walking into Jaspers is a little like walking into a garage sale. There is paper and stuff on the floor, juke boxes that are in-op at each table, and a cheesy 50's motif that could only be appreciated by patrons of roadhouse along route 66. I have been to quite few "greasy spoons" in my day, for research purposes only, and I am NOT saying Jaspers is one of them, but for a place that bills itself as "gourmet" the very least they could do is spritz up the place a little bit. For example, I went to restroom to wash off the rigors of another brutal teaching day when I noticed the soap dispenser did not work. I find it ironic that in a gourmet restaurant the soap is in-op and there is sign above it detailing the state law about how employees must "laven sus manos" after each visit. We ordered the "Giant Burger" with cheese and a side of fries, "skins on", as they call them, and a couple of sodas. The sodas were all you can drink, self serve, Coke-a-cola fountain with an exact syrup to soda ratio. I must say though I am growing weary of "sliced ice chips"(we need someone to almost choke to death. What ever happened to cubes? Or even better the snow type ice that used to come in the styrafoam cups that kept a drink icey cold without freezing your hand off. Environmentalists were "tripp'n" over the ozone layer being destroyed by CFC's in the styrafoam, when all along it was bovine flatulence destroying the fragile layer of our atmosphere. Therefore, eating cheeseburgers with an icy cold Coca-Cola in a styrafoam cup that requires no coaster (there is very little condensation to a styrafoam cup do to the excellent insulative properties of the miracle molecule: styrafoam), is actually better for the environment. Jaspers Giant cheese with a slice of American Cheese, a folded leaf of lettuce, red onion, two tomatoes, mayo, mustard, and no pickles. The burger was cooked with a little juice left in the meat, but there was little or no seasoning. I did like the thickness of the patty, but it did not match up with the bun too well, there was way too much bun left over after the meat was gone. The bun was a grocery store standard, toasted, with sesame seeds, sort of flat like a whopper bun. As a burger all together it was pretty good. I just think that a burger lover could do a lot better for the money. Our selection was $5.20, the only thing gourmet about this burger was the price. The fries were billed as "skin on", but I had to wonder if they were painted on or put on with a marker. They were medium brown, very crispy, with a lack of salt. The oil was a nice touch for these "sticks", because they were not greasy in the least. In fact they had little or no taste other than a slight vegetable oil finish. The taste was not potato, it was more like salty oil. The fries were just vehicles to carry hot oil that needed to be immersed in salt for any flavor what-so-ever. I would not actively seek out a Jaspers if I were in another town, but I would not protest if the whole gang from work wanted to go there for lunch. Jaspers is extremely mediocre in its efforts to be the "World's Greatest Burger", one could do a whole lot worse I am sure, but for the money I would go to one of the major chains like In and Out or even Carl's Jr.